What Languages Are Spoken In Costa Rica? Spanish is the official language of Costa Rica. A number of indigenous languages such as Cabécar, Bribri, and Maléku are also spoken there. 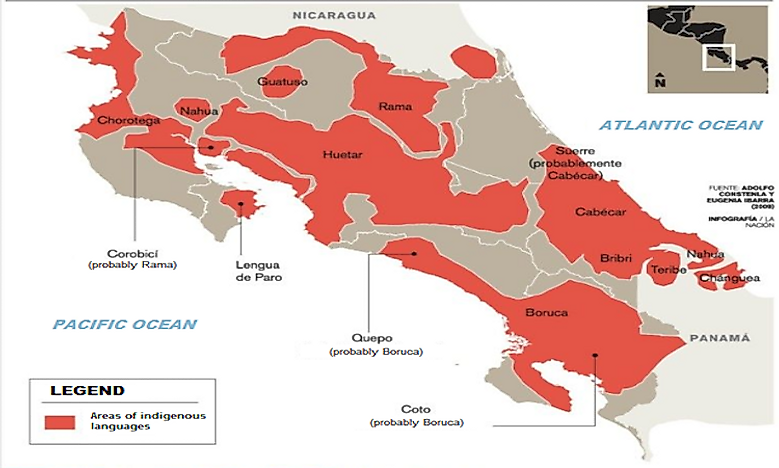 Map of indigenous languages of Costa Rica before the arrival of the Spanish. Costa Rica is a Central American country with a population of 4.5 million. San José is the country’s capital and largest city and its metropolitan area hosts nearly a quarter of the Costa Rican population. Prior to the Spanish colonization of the country in the 16th century, Costa Rica was inhabited by small populations of indigenous people. The nation declared sovereignty in 1847 and since then, has been one of the leading Latin American nations in terms of prosperity. It also abolished its army in 1949 after a bloody civil war and is one of the few nations of the world without a standing army. Spanish is the official language of Costa Rica. The language came into prominence after the arrival of the Spanish in the country. The Spanish rulers established the language as the official language of the country which continue to hold the same status to this date. Spanish is used in the government administration of the country, by the media of the country as well as the educational institutions of Costa Rica. Cabécar language: It is spoken by the people of the Talamanca mountain range and the Southern Pacific region. Bribri language: Bribri is the Costa Rican language that is spoken on the Atlantic slopes of the country and shares territories with the Cabécar language with which it is closely related. Maléku language: This language of Costa Rica has about 800 speakers in the country living in the north-eastern Alajuela Province. Guaymí language: The territories of this language overlaps with that of the Buglere language with which it is closely related. Costa Rica has received a large number of immigrants over the years from countries across the world. The immigrants contributed to the foreign languages of Costa Rica. Mekatelyu or Patua, an English-based Creole language is spoken by the Afro-Carib immigrants who have settled primarily in the Limón Province along the Atlantic coast of the country. The Quakers community of Monteverde speaks an older dialect of English that uses thou in place of you. The deaf community of the country uses the Costa Rican Sign Language. A number of indigenous languages spoken in Costa Rica have died out over the years and still more are endangered. There is a need to protect the existing languages as they enrich the country’s linguistic diversity and help maintain the cultural diversity of the nation. The government of Costa Rica is thus taking steps in this direction. What Languages Are Spoken In Saudi Arabia?